With 1997’s OK Computer they morphed into an uncompromising prog-rock band and since Kid A, they have moved further and further into avant-garde territory with each new release, with not a care as to how many will follow them at each step. It is a commitment to an artistic vision that is both brave and exemplary. So if you are going to cover a Radiohead song, perhaps the best way to do it is not in the form of a note for note cover, but taking a leaf out of the Oxfordonian’s own book - and approaching it from left-field and doing something with it nobody wold expect - step forward Galway band Tradiohead. The idea to play Radiohead songs in a trad style came from Jimi McDonnell. He suggested it to Michael Chang who liked the idea. Initially nothing happened with it, but when it came up again at the end of last year, both men knew they had to run with, and they found Philip and Pat ready and willing to get involved. The band clearly enjoy what they do and have fun with the concept, but it would be a mistake to think of them as anything other than serious musicians - this is also something to be creative with and to challenge themselves with. Michael Chang describes himself and his colleagues as “massive Radiohead fans and massive trad fans”. Michael is originally from Seattle and first became exposed to Irish trad in a number of the city’s bars. So what can audiences expect from a Tradiohead show? 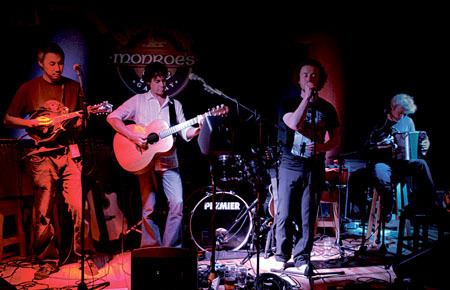 As well as playing Radiohead songs in a trad style, the band also play trad, inspired by the work of Radiohead. One example is a piece called ‘Kid A On The Mountain’. “For that we turned a slip jig we knew into a reel,” says Jimi. Although the band have only played a handful of gigs, they have already attracted a positive response, drawing an audience from both Radiohead/alternative rock fans and the trad crowd. While the band’s next Galway show is at The Crane, they will also be travelling to Stradbally next month to play Electric Picnic, something the quartet are very excited about.